It’s not that often that one of those crazy-looking transportation concepts you see on the cover of an old 1950s Popular Mechanics comes true, but I’m delighted to say that’s happened. 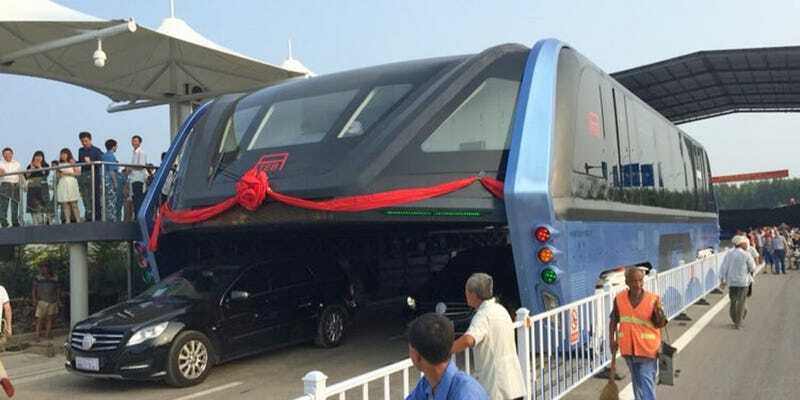 In China, a traffic-straddling bus now actually exists, and it’s bonkers and glorious. Here’s everything about it you need to know. Everybody’s been going nuts about this seemingly insane concept for a while now, mostly because it’s so far beyond the mundane realities of public transportation as we know it. The concept of a bus (or similar vehicle) that allows traffic to pass under it while in motion has been around a while, but it’s always been regarded as a pipe dream. At least, until yesterday, when an actual, working prototype was revealed in Qinhuangdao, China. It’s only going to be testing in a limited area, but it’s still real, and still amazing. I’m sure you have a lot of questions, so let’s see what we can do about that. It’s official name is Transit Elevated Bus, but it has a cooler literal Chinese name. Iron Bar is a pretty cool nickname for it, if you ask me. I should mention an actual Chinese speaker told me that it actually translates to “rail bus.” Oh well. Even though it was expensive, it was built to save more money. So, how does a radical drivable bridge that costs (according to initial estimates from 2010) $75 million or so save money? By making it possible to not spend about ten times that much building a subway system. The TEB is designed to reduce traffic congestion in cities without the need to build new infrastructure like roads or subways or anything like that. It sort of adds a virtual second story for bus travel to existing roads. Very clever. There was a similar idea way back in the 1960s called the Landliner. The BosWash Landliner (BosWash was the name futurist George Fieraru gave to a hypothetical future megalopolis that reached from Boston to Washington) was a 200 mph over-the-road behemoth that rode on a cushion of air-bearing rails and was capable of picking up a full bus at 60 mph, swallowing it up into its belly to either transport the passengers or maybe make them into Soylent Green. Inside, it was like a whole mall on air-rails, blasting through BosWash at 200 mph, slowing to swallow a few more buses, and then speeding back up. What we’re looking at now in China is a vastly scaled down version of this concept. The initial idea for this particular version is from 2010, and the company that proposed it is called Shenzhen Hashi Future Parking Equipment Co.
Future Parking Equipment Company? If I had to guess, I’d think a company named that made novelty silver lamé valet outfits, but that’s very much not the case. Early renderings show a much more streamlined looking bus, with no articulated segments, driving over a Chinese-market Jeep. More recent renderings show a multi-car, articulated bus-train like system, with the articulated bendy sections helping the bus get around curves and corners. The current prototype is just one segment, without the articulated accordion sections in between. Theoretically, a second prototype could be connected to this first one to test the articulated turning system. The bus is electric, and uses a very strange brake design. Well, I think it’s pretty strange, but since there’s never really been a drivable bridge like this thing, it could be that what looks unusual to me is going to be orthodox engineering for these sorts of vehicles. You can see details of the drivetrain and brake system in the video up there. We see there that the bus is using hub-mounted motors for propulsion. This, of course, makes a lot of sense, as it allows the drive train to be highly modular, redundant, easy to swap/service, and eliminates the need for a separate steering mechanism, since wheel motors on each side can be varied in speed to allow for a sort of skid steering type of setup, like that used on tanks, and, maybe more closely, Mars rovers like Curiosity, which use (much smaller) wheel hub motors as well. To my very automotive-accustomed eyes, this looks bonkers. I see the fairly standard disc brake assembly there, but I’ve never seen one connected via what looks like a belt (a chain? A hidden gear assembly?) to a wheel, vertically. Inboard disc brakes on a driveshaft, sure, but never anything like this. It also appears that additional wheels with brakes can be deployed as emergency brakes. This is very weird. I can’t wait until pictures of the internals of the prototype get released so I can see how this was implemented. It’s going to recharge at each station, and only needs to store enough energy to get to the next one. An electric vehicle of this size would normally make an engineer want to go on a 48 hour booze bender just thinking of the size and weight of batteries needed to give it usable range. The good news here is that its usable range is actually a very small distance, since the system is designed to get recharged at every station it passes. Diagrams suggest that the TEB will have a pair of rails on the roof that will form part of a “direct relay charging system.” The stations will have a conductor arm that will drag along the charging rails, providing power to the bus as it moves alongside (or sits) at the station. There must be some amount of storage batteries on the bus itself that hold the charge, which would be enough for it to get to the next station. A lot of the drawings and presentations suggest the use of solar power as well, but where the power comes from doesn’t really matter to the TEB. Some videos have shown an optional rail system that could be built to charge the bus as well, but in baseline form the TEB should be able to recharge from station to station, driving over conventional roads in between. Earlier versions of the system seem to have implied a reliance on tracks; improved battery technology in the past six years may be responsible for this change. Hypothetically, I suppose it could be possible to fit the TEB with an overhead conductor system to use overhead power lines as well, if that made sense in a given city. The taillights seem to be traffic light repeaters. While earlier versions and mockups seem to have had more conventional taillight designs, the current prototype incorporates traffic light repeaters that reflect the state of the traffic lights in front of the bus for the cars entering it. Hence the familiar red-yellow-green stack of lights at the rear. There also is a large text-display LED matrix in the middle. Headlights seem to be mounted below the traffic lights, and both ends seem to have the same lighting setup, confirming that the TEB is designed to operate in either direction. I really want to see the box those wiper blades come in! Seriously, that wiper blade has to be four or five feet long, right? “Animated light displays to simulate stationary objects to prevent disorientation of drivers underneath.” This sentence shows up on several sites, including Wikipedia, and I’m not entirely certain what it means. I think it means there will be projections of objects, like what you’d normally see out a car window, moving past, so the experience of essentially being in a room moving the same speed as you doesn’t confuse you into thinking you’re stationary? Wouldn’t a few well-placed windows do the trick, too? I need to see this one in action.